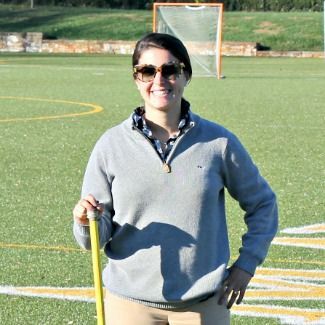 Jordy Kirr ’07 attended Georgetown University, where she majored in English and played lacrosse. As a freshman, Kirr started all but one game, earned All-American honors from WomensLax.com, was selected to the IWLCA All-Rookie squad and won the Sheehan Stanwick Rookie of the Award, among other honors. After graduating, Kirr went on to Marquette University, where she worked as an assistant coach for the women’s lacrosse team and earned a master’s degree in Sports Leadership Management. Kirr returned to Bryn Mawr in August 2015 to serve as assistant athletic director and head lacrosse coach. I’ve wanted to coach since I was a young girl. As a player, I definitely assumed the role of directing others on the offense. My strengths are seeing plays develop and communicating them to my teammates. Helping teammates out on the field made me feel fulfilled. It is also important to me that I give back to the sport that has afforded me so many opportunities in my life. I think that Physical Education and athletics have benefits beyond the physical. The cognitive and emotional benefits are often overlooked, and as a physical education teacher and coach I really do care about teaching students about these benefits as well. The community building, through participating in team games and spirit of competition, is also an aspect of our work that is often underestimated. While I miss coaching lacrosse year-round [at the college level], I appreciate the anticipation of the spring. My position at Bryn Mawr combines my passion for the sport industry with my burning desire to coach lacrosse and mentor young women. Coaching high school student-athletes allows for more attention to the fundamental skills, which is lacrosse in its purest form. I also really enjoy meeting students and helping them navigate the college recruitment process. It is rewarding to use my college recruiting experience to help students find the right academic and athletic fit for them. It seems like I was destined to come back to Bryn Mawr to work in athletics. According to the 2007 yearbook section, “In 20 years… Where Will We Be?”: “Jordy Kirr returned to Bryn Mawr to teach physical education, replacing Ms. Kridel as Athletic Director.” Even funnier, for Halloween one year classmate Allie Emala ’07 and I dressed up as Jeanette Budzik and Wendy Kridel. It is scary how much we looked alike! The picture now hangs in my office, and amazingly, Allie is the new Head Varsity Field Hockey coach and I’m now Head Varsity Lacrosse coach. My favorite part of this job is that it doesn’t feel like a job. I truly love working with the students on a daily basis. Their ambition and goals remind me of myself at their age, and I am passionate about making each one of their experiences the most positive it can be. I am grateful to have a job in a community that is near and dear to my heart that allows me to inspire young women through athletics. And while I already knew the faculty cared deeply about their students, it wasn’t until I joined the faculty that I realized how much time, energy and thoughtfulness faculty members pour into individualizing the learning experience. There are so many things that I remember about my time at Bryn Mawr. I remember feeling safe and closely tied to each one of my 2007 classmates. I remember believing in Bryn Mawr, and I remember Bryn Mawr faculty and peers believing in me. I remember Bryn Mawr through the sport seasons, and I remember Bryn Mawr through the close relationships that are still intact today. I loved learning in an environment where classmates appreciate one another for who they are. Bryn Mawr also taught me how to balance the strong academic rigors and athletic demands. It developed my writing skills, and helped grow my confidence to speak boldly. Bryn Mawr taught me to initiate by asking rather than wait to be called on.